Dec 2010: Mazy Zwart was in Belo Horizonte talking about the Midwifery Model of Care, homebirth in Holland and her work as a midwife in Portugal. Canadian researcher Hélène Vadeboncouer spoke of the International Mother Baby Iniciative and the demonstration site here in Brazil, Hospital Sofia Feldman. I spoke as a doula, childbirth educator, activist and mother. I also served as translator during the week. Something that became very clear is the overwhelming need for more prenatal Childbirth Education for women in Brazil. Women must have more access to regular prenatal education so that they may know the choices available to them and their rights. 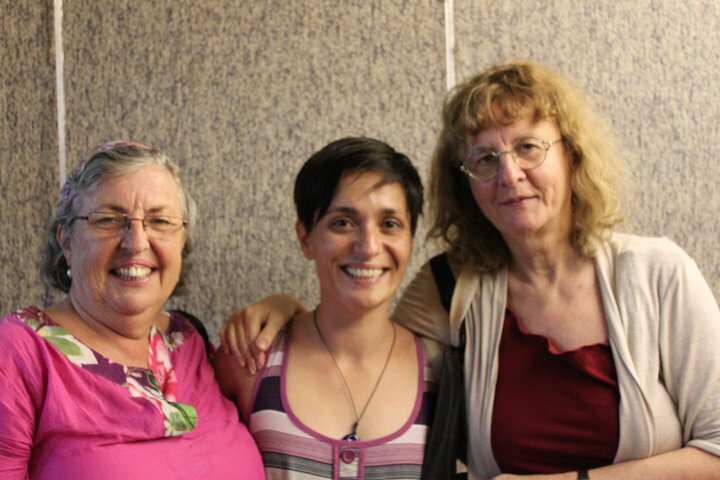 Dec 2010: Mary Awart esteve em Belo Horizonte para falar sobre o Midwifery Model of Care (Modelo de Atenção Humanizada), sobre o Parto Domiciliar Planejado na Holanda e sobre o seu trabalho em Portugal. A pesquisadora canadense Hélène Vadeboncouer contou sobre a Iniciativa Internacional Mãe Bebê, o Hospital Sofia Feldman servirá como local de demonstração. Eu falei sobre minha visão como doula, educadora perinatal, ativista e mãe. Eu também servi como tradutora durante a semana. Algo que ficou bem claro é a necessidade de oferecer mais cursos Educação Perinatal para mulheres no Brasil. Mulheres precisam ter acesso regular à educação prenatal para que possam conhecer suas opções e seus direitos. I get to hold the baby! Another reason why I LOVE my job! Gabi is so cool she chose a holiday to make her grand entrance. Read this amazing birth story and see lovely pics taken by lucky old me at mom´s blog. Birth has become overly medicalized in Brazil. Sure, that is a true statement for almost any country in the world. As we look at the rates of unnecessary interventions and abuse of technology, from cesareans to inductions to institutional violence, we have begun to ask ourselves what we can do to change this reality. It is my hope that in sharing the birth practices of Brazil others may put this information to good use, consciously asking questions and adapting strategies that work to the needs of their communities. Let us remember that our cultural beliefs, fears and myths play a big part in maternal and perinatal health. It is only human to fear that which we do not understand. Brazil is a country of women who live in diverse birth realities. Although it is accepted as a fact that 99% of pregnant women receive care in hospital, this is not true. Women in the poorest and most remote areas of the North, Northeast and Amazon Rainforest areas of Brazil may have to travel great distances to get to a hospital. Thus, in these areas due to this and local cultural women are still largely attended by Traditional Midwives at home. Now, in the large metropolitan cities women do have easir acess to hospitals. The care in maternity hospitals is largely medicalized. A large number of births are c-sections (some hospitals rate up to 99%), the births that do end up being vaginal are most likely to include a cascade of rotine interventions from oxytocin (pitocin), shaving of the pubic area, epidural anesthesia, forceps, episiotomy and mother-baby seperation. I have been involved with what is called being called the Humanization of Birth movement, both locally and internationally. When we used the term Humanization, it can mean different thing to differnt people but focuses on care that is respectful and based on the best scientific evidence available [evidence-based practices]. My role as an educator and doula is to offer options to women, to offer resources for risk veresus benefit of interventions and to support women´s autonomy to choose the birth they want. Birth philosophy is life philosophy. We give birth the way we to live our lives. My name is Alessandra, or Alex for short. I´m a Brazilian-American, Birth Diplomat offering doula, childbirth services and holistic therapies to Expat Moms and Couples living in Brazil. I´ve also lived the adventure myself, having given birth to my kids in 2 different countries. In 2001 we were blessed with a Dallas Girl, Ananda, in the United States and in 2004 we were blessed with a Boy from Beagá, Nathan, in Brazil. I´ve also had the opportunity to assist women both in the US and in Brazil in achieving the experiences they desired. Let me help you too. I am deeply honored to be of service and absolutely love working with moms, dads and babies! Services offered at my office, in your home, at hospital and online via skype (alessandragodinho).